Type : About 2 1/2 LBs (pounds) of mineral rocks for sale. Your box will contain both rough rocks and minerals as well as tumbled and polished gemstones. 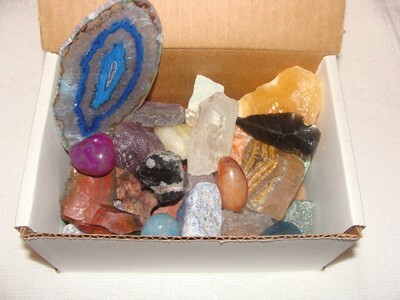 EVERY BOX will include an arrow head, and a quartz crystal, as well as an agate slab. 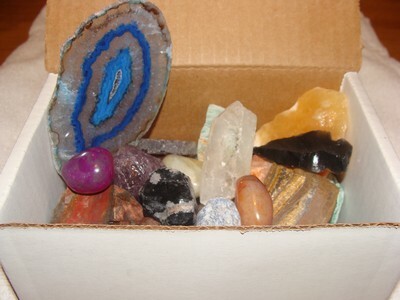 This would make a great gift for anyone who likes rocks and gems. 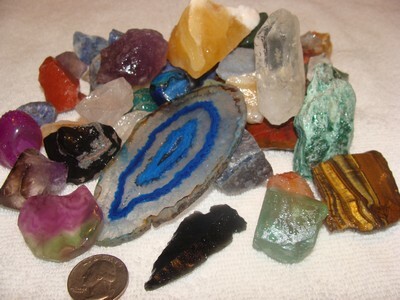 Typical rocks in this rocks and minerals collection include Amethyst, Snowflake Obsidian, Emerald, Apatite, Tigereye, Orange Calcite, Blue Calcite, Green Calcite, Flourite, Tourmaline, Purple Aventurine, Blue Quartz, Green Quartz, and More. Box is a sturdy white cardboard box with a lid that closes.